In this section ask-math will teach you vector addition and subtraction. Vector operation has two basic operations on vectors which are addition of vectors and scalar multiplication. Vector addition :Addition and subtraction of vectors result in another new vector which has a different magnitude and direction. 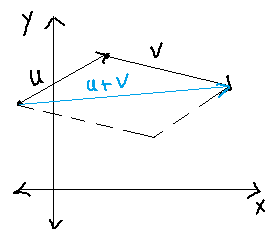 To add two vectors u and v geometrically, first draw the 1st vector and now draw the 2nd vector in such a way that the terminal point of the first vector coincides the initial point of the second vector.The sum will be u + v which is the new vector formed by the joining the initial point of the first vector and the terminal point of the second vector.This method of adding vectors is called the Parallelogram law for vector addition. The resultant vector is u + v .
For addition and subtraction of vectors we should know the components of the given vectors and then we simply add and subtract the components. Example 1: Let u =$\left \langle -2,5\right \rangle $ and v = $\left \langle 3, 4 \right \rangle$. Find 1) u + v 2) u - v 3) v - u. Example 2: Let u =$\left \langle 1,4\right \rangle $ and v = $\left \langle 3, 2 \right \rangle$. Find 1) u + v 2) u - v .